Traffic was slow on eastbound I-66 following the crashes just before 6 p.m. near the intersection with Virginia Route 123 in Fairfax County. Traffic is proceeding around the incident site, but it's crawling, WTOP traffic reporter Bob Marbourg said. All lanes have reopened on Interstate 66, three hours after several crashes near the intersection with Virginia Route 123 slowed the afternoon commute Thursday in Fairfax County, Virginia. 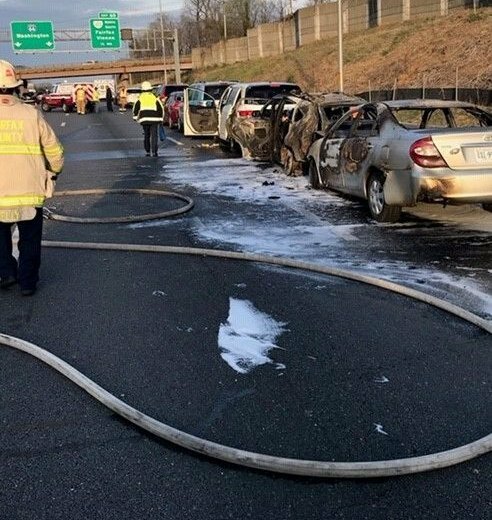 In a statement, Virginia State Police said they got a call about a two-vehicle crash in those eastbound lanes around 5:50 p.m. A chain-reaction crash involving 12 cars had followed, as drivers tried to avoid the initial crash. The last two cars of those 12 caught fire. Only a minor injury has been reported, police said. That driver was treated at the scene. Traffic was moving to a crawl even after two lanes were reopened, eventually easing up around 8:30 p.m., when the last closures were removed. Check with WTOP Traffic and tune in to 103.5 FM for traffic updates on the eights.